He has two businesses, each with a nostalgia theme. As a mobile deejay, Gup Gascoigne is known as The Golden Gup using his collection of 30,000 45s and 1,200 LPs to play everything from the Swing Era and the glory days of rock'n'roll and rhythm and blues. As a jukebox restorer and collector, he is known as "The Duke of Jukes". Gascoigne was born in 1953 and in many ways, he never left. His home is furnished with diner booths and Seeburg Wall-O-Matic jukeboxes. 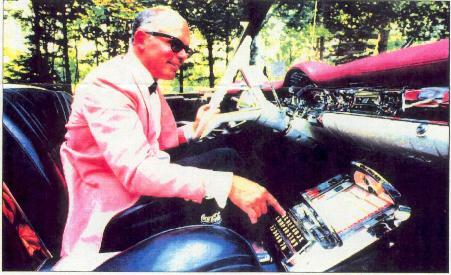 Gup Gascoigne of Denville NJ, below, takes his show on the road, courtesy of a 1958 Olds Starfire custom-equipped with a 160-selection Seeburg Wallbox.